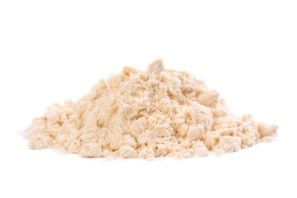 Coconut flour is simply dried, ground up coconut meat. Besides adding flavour, this whole food flour provides many beneficial properties, including being rich in dietary fibre and a good source of protein. It is gluten-free, wheat-free and vegetarian. No chemical bleaching. No alcohol treatment. No additives. No anti-bacterial or anti-fungal agents. No bromate added.